What it is: [From the publisher] The Boxcar Children, published sixty years ago in 1942, has captured the imaginations of generations of readers. 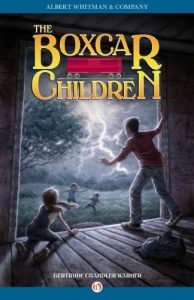 For the first time, and in honor of the 60th anniversary, Albert Whitman & Company is publishing a special edition of The Boxcar Children.The Aldens begin their adventure by making a home in a boxcar. Their goal is to stay together, and in the process they find a grandfather. What I love: Any book that gets a 9-year-old boy to love reading gets 5 out of 5 stars. My son’s class was reading the first book in the series and he would always ditch the timer and read much more than what was required. I think he loved visualizing what he was reading in each scene. He talked about the book ALL the time: while we ate dinner, tossed a football, drove home from school … Finally, his teacher suggested that he take home some of the other books in the series, which she had in her classroom library. I love the fact that this classic series is still popular (I read it, as did my mom), but I especially love that my son was excited to do his reading homework every night. There are now 140 titles in the series.